Last updated on: January 26, 2019. This name uses Spanish naming customs: the first or paternal family name is Moyá and the second or maternal family name is Llompart. Carlos Moyá Llompart (Spanish: [ˈkaɾlos moˈʝa ʎomˈpaɾt]; born 27 August 1976) is a retired world no. 1 tennis player from Spain. He was the French Open singles champion in 1998 and was the singles runner-up at the 1997 Australian Open. In 2004, he helped his country to win the Davis Cup. He is one of Rafael Nadal's coaches. He currently resides in Madrid, Spain. Moyá was born in Palma, Majorca, Balearic Islands, Spain. He began playing tennis at the age of six with his parents. He turned professional in 1995 and won his first tour title later that year in Buenos Aires. In November 1995, at the age of 19, Moyá won his first tournament at the top-level in Buenos Aires, defeating Félix Mantilla, 6–0, 6–3, in the final. In May 1996, Moyá defeated the "king of clay" Thomas Muster, 6–3, 6–3, in the semifinals of the tournament in Munich, ending Muster's streak of winning 38 matches in a row on clay-courts. It was the fourth time in four weeks that Moyá had played a match against Muster. In the final of Munich, Sláva Doseděl defeated Moyá, 6–4, 4–6, 6–3. In 1997, Moyá reached his first Grand Slam final at the Australian Open, defeating defending champion Boris Becker in the first round, Jonas Björkman in the fourth round, and world no. 3 Michael Chang in the semifinals in straight sets, before losing in straight sets to Pete Sampras. Before the US Open, he won brilliantly in Long Island. His opponent in the final was the future winner of US Open a few days later, the Australian Patrick Rafter. Moyá due to an injury lost at first round in US Open. Due to his final in Australia and the last winning in Long Island, Moyá could have had a good opportunity in Flushing Meadows. In 1998, Moyá won the French Open. He defeated Sébastien Grosjean, Pepe Imaz, Andrew Ilie and Jens Knippschild before beating the tournament favourite, Marcelo Ríos in the quarterfinal. He then defeated Félix Mantilla Botella in the semifinal and fellow-Spaniard Álex Corretja in the final with a straight-sets win. He also won his first Tennis Masters Series tournament that year at Monte Carlo. He reached the semifinals of the US Open, losing to Mark Philippoussis. He concluded the year by finishing runner-up at the ATP World Championships (now known as the ATP World Tour Finals), where he lost in a five-set final to Corretja, having won the first two sets. In March 1999, after finishing runner-up at Indian Wells, Moyá reached the world no. 1 singles ranking, the first Spanish player in history to achieve this feat. He held the top spot for two weeks. Later that year, he entered the French Open as defending champion and lost in the fourth round to eventual winner Andre Agassi. At the US Open, Moyá withdrew in the second round with a back injury and only played in two tournaments for the rest of the year. Despite being hampered with a stress fracture in his lower back from the 1999 US Open through the early part of 2000, Moyá still finished in the top 50 in the world for the fifth straight year. He reached the fourth round of the US Open, where he held a match point in the fourth set, but eventually lost to Todd Martin in an epic five-set marathon, 7–6, 7–6, 1–6, 6–7, 2–6. Moyá's best result for the rest of 2000 was winning at Portugal over his countryman Francisco Clavet. In 2001, Moyá won the title at Umag. 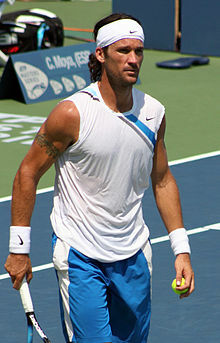 He also finished runner-up at Barcelona, where he lost in a four-hour marathon final to countryman Juan Carlos Ferrero. 2002 saw Moyá win four titles from six finals. He captured his second career Tennis Masters Series title, and the biggest hard-court title of his career, at Cincinnati, where he defeated world no. 1 Lleyton Hewitt in the final. Moyá captured three clay-court titles in 2003. He also helped Spain reach the final of the Davis Cup, compiling a 6–0 singles record. In the semifinals, he won the deciding rubber against Gastón Gaudio as Spain beat Argentina, 3–2. He beat Mark Philippoussis on grass court in the final. But that proved to be Spain's only point, as they lost the final 1–4 to Australia. In 2004, Moyá helped Spain go one better and win the Davis Cup. In the final, he won two critical singles rubbers against Andy Roddick and Mardy Fish, as Spain beat the United States 3–2. The year also saw Moyà capture his third career Masters Series title at Rome, where he defeated David Nalbandian in the final, 6–3, 6–3, 6–1. He was the only player on the tour to win at least 20 matches on both clay courts and hard courts that year. In July 2004, Moyá's kind-hearted gesture to hit with ball boy Sandeep Ponniah at the 2004 Tennis Masters Series Toronto event captured audiences during an injury timeout against opponent Nicolas Kiefer of Germany. To the crowd's surprise, Ponniah shuffled Moyá across the baseline and received an ovation for an overhead smash on a Moyá lob. Moyá won his 18th career title in January 2005 at Chennai. He donated his prize money for the win to the 2004 Indian Ocean earthquake and tsunami victims. In January 2007, Moyá was the runner-up at the Medibank International in Sydney, losing to defending champion James Blake. In May 2007, at the Hamburg Masters, he defeated Mardy Fish, world no. 12 Tomáš Berdych, world no. 9 Blake, and world no. 6 Novak Djokovic, a run which saw him reach his first Masters semifinal since 2004 Indian Wells. After reaching the semifinals against Roger Federer, Moyá lost, 6–4, 4–6, 2–6. Moyá lost against Rafael Nadal in straight sets in the quarterfinals of the 2007 French Open. During Wimbledon, Moyá lost in the first round to Tim Henman in a five-set thriller, the fifth set stretching to 24 games (Henman won 13–11). Despite the loss, Moyá had no points to defend (he had not played a grass-court match in a few years), resulting in his moving to world no. 20, his first time inside the top 20 since 13 June 2005. In July 2007, Moyá won the Studena Croatia Open in Umag, Croatia, defeating Andrei Pavel, 6–4, 6–2. The win brought him to world no. 18 in the rankings, his highest rank since 23 May 2005, when he was world no. 15. In August 2007, Moyá lost to Marcos Baghdatis in the first round of the Montréal Masters. At Cincinnati, one week later and just two weeks shy of his 31st birthday, he beat David Nalbandian, 7–6, 7–6, world no. 3 Djokovic, 6–4, 6–1, and Juan Martín del Potro, 7–5, 3–6, 7–5 (after being down an early break in the third set), to set up a quarterfinal clash with Lleyton Hewitt. In 2008 at the Cincinnati Masters, Moyá defeated Nikolay Davydenko, 7–6, 4–6, 6–2, the match being played over the course of two days because of rain. Hours after his match with Davydenko, Moyá beat Igor Andreev, 6–4, 7–6. Moyá made a slow start in 2009. He failed to progress beyond the second round of his first four tournaments, including a first-round loss at the Australian Open. In March 2009, he announced that he would have an indefinite hiatus from tennis to recover from injured tendons and ischium in his hip. He returned to professional tennis in January 2010, losing against Janko Tipsarević in the first round of the Chennai Open, then losing in the first round of the 2010 Australian Open to Illya Marchenko. On 17 November 2010, he announced his retirement from tennis owing to a long-standing foot injury from which he failed to recover. He received a special ceremony at the O2 Arena in London during the 2010 Barclays ATP World Tour Finals, with all top eight singles and doubles players attending. Other players who attended included Fernando Verdasco, Mikhail Youzhny, Àlex Corretja, Jonas Björkman, and Thomas Johansson. He has won ATP Tour singles titles in 11 different countries: Argentina, Croatia, France, Italy, India, Mexico, Monaco, Portugal, Spain, Sweden, and the United States. Runner-up 17. 19 January 2004 Sydney, Australia (2) Hard Lleyton Hewitt 3–4 ret. ^ "Carlos Moya retires due to foot injury". The Daily Telegraph. London. 17 November 2010. Retrieved 17 November 2010. This page was last edited on 10 February 2019, at 21:48 (UTC).